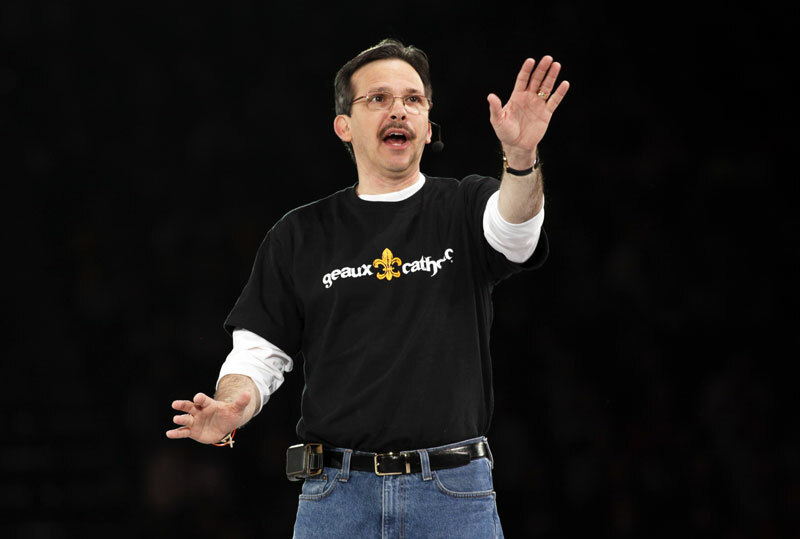 Before he shared “the parable of the iPod touch” to make a point about faith, Mike Patin used a touch of humor to connect with the 23,000 teenagers at the National Catholic Youth Conference in Indianapolis. One boy kept waving his hand, a boy that fit Patin’s belief that “every class has one person you should not call upon.” Still, in a moment of kindness or weakness, Patin called upon the boy. The crowd inside Lucas Oil Stadium roared with laughter during that morning general session on Nov. 18. The laughter continued as Patin, the keynote speaker for the session, began his parable of the iPod touch, an electronic device that can shoot video, make video calls, and play music, videos and games. Patin shared how he received the electronic device as a Christmas gift last year from his 19-year-old daughter, Megan. He also shared how he received a stern lecture from her when he was so intimidated by the device that he first decided to use it as a paperweight and then as a door stopper. After mentioning how “it’s something when your daughter dresses you down,” Patin made the connection for the audience between his fear and uncertainty in using the electronic device and many people’s fear and uncertainty in sharing their faith. Patin said he understands how people get caught up in comparisons to others, leaving them with the feeling that they’re not the right person to share their faith. “You’re going to hit places I ain’t ever going to be able to hit—the mall, Facebook, your friends, your school,” he continued. “I’m asking you as a teenager who’s struggling and trying to find Christ and working at staying connected to learn to use your style, your playlist. Holding the iPod touch, Patin shared one more thought.